Using digital tools to coordinate purchasing across plants can reduce inventory by half without damaging either plant efficiency or customer service. 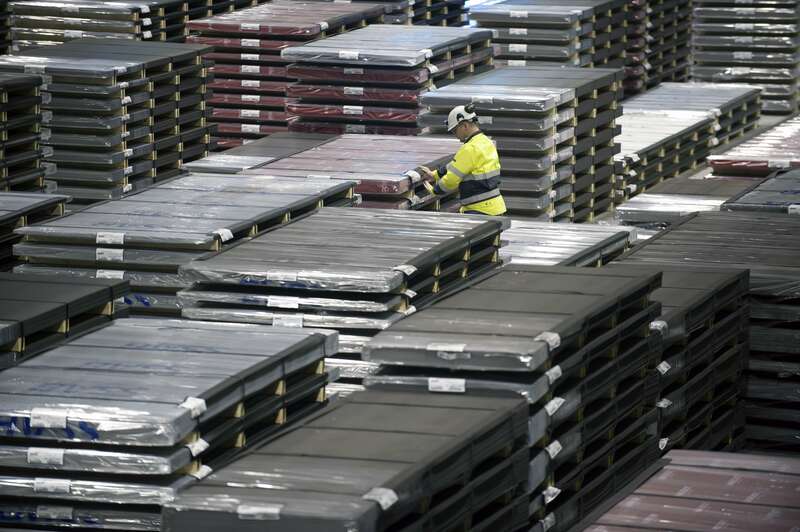 Many engineered metals companies have been using acquisitions to grow. However, once they acquire new plants, they often keep planning and purchasing of raw materials siloed within each plant—creating an excess amount of inventory stored in a variety of locations. Effective inventory management requires integrated planning that links raw material purchases to customer orders along with inbound hubs to distribute materials to geographic regions. This kind of large-scale coordinated effort requires innovative approaches. Forward-looking companies have been using proven digital tools from other industries, including high-tech, oil and gas, and consumer packaged goods (CPG), to reduce their raw material inventories by as much as 50 percent with no negative impact on either plant efficiency or customer service. In the engineered metals industry, managing inventory for raw materials has received less attention than for more expensive finished goods. However, many large companies have an excessive amount of common raw materials spread across their plants. Mergers and acquisitions have exacerbated this problem as planning and inventory management often gets left intact for each plant. In addition, heavy metal ingots and slabs are expensive to transport, making pooling these raw materials difficult to justify. Other aspects of the industry fuel a just-in-time approach to inventory. Demand for engineered parts is relatively stable compared with most value chains. 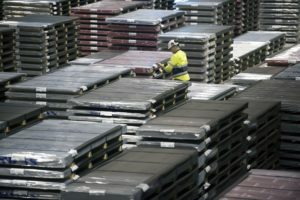 Customer order book is long, and sources of metal supply within the United States allow for short lead times, which lets companies keep a limited inventory and still maintain efficient plant operations. 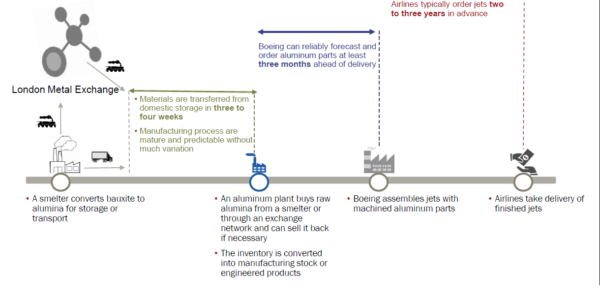 Consider, for example, aluminum parts for the aerospace industry (see figure 1). An airline company typically order jets several years in advance, and everything from the plant that makes the jets to the parts and raw materials suppliers are in the United States. This has resulted in a just-in-time inventory process. Some companies have an overall raw material inventory that is almost twice what it should be. Figure 2 illustrates the raw material inventories required for a 99 percent service level to a company’s plants. The $3,455,000 in inventory is nearly double the optimal of $1,784,000—representing an opportunity to reduce inventory by 50 percent. Set up the ability to view current and forward-looking inventory and days of supply by part numbers, including on-hand, on-order, and in-transit quantities. This is no easy task as each plant often has its own enterprise resource planning (ERP) system with the same parts using different part numbers from plant to plant. Consider all inventory when accounting for on-hand stock, including supplier-owned and customer-consigned items. Measure and report daily plant operations’ key performance indicators to ensure that the effort to reduce inventory does not negatively affect plant service levels. Create the ability to feed a forward-looking production plan and the associated raw material needed for each part number. Share the demand forecast with suppliers several weeks out, and require an accurate forward-looking commitment at least four weeks out to cover the plant execution window plus transit time for the materials (usually two to three weeks for rail mode). 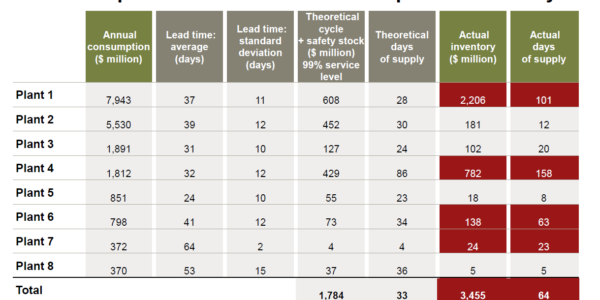 Accurate lead times are required to remodel safety stock by addressing supply lead time and variability (sometimes measured as supplier fill rate) to reduce the just-in-case buffer inventory. Link suppliers’ purchase orders to planned consumption two to four weeks out with carefully planned safety stock levels. Capture week-to-week changes in demand to continuously improve safety stock requirements. A.T. Kearney has experience configuring off-the-shelf digital tools and building custom solutions that can systematically create a view of inventory and integrate with core ERP systems. In fact, we have helped several companies create pilot implementations in as few as 10 weeks. Inbound hubs can enhance inventory control by pooling and staging materials for plants in the same geographic region. To get even more inventory control, pool standardized materials from the same supplier within an inbound hub. If there are many common parts across plants (which is always the case with metals and for parts for maintenance, repair, and operations), hubs offer a way to pool safety stock and diminish the bullwhip effect of changes in supply and demand. Pooling common materials also improves inventory turnover since geographies are pulling from the same distribution point. Beyond stocking common parts, inbound hubs are also beneficial for metals with various segmented demand–supply characteristics, including direct imports from low-cost countries, low velocity of flow (for specialty metals used as additives, such as cobalt and tantalum), and high variability in demand. An effective hub can even be virtual—assessing the raw material needs across plants and then sending the material out based on the latest demand a week before the execution lead time. The high-tech industry—with a complex supply chain, highly customized products, and a wide array of global operations—offers some good examples of digital tools for managing inventory. Cisco, for example, mapped its business requirements and migrated to a global digital system to improve end-to-end visibility of raw materials and orders. With data linked between upstream and downstream supply chain partners, order fulfilment has been automated and synchronized with material planning. As a result, Cisco reduced inventory by 61 days, lowered supply chain costs by $695 million, and improved time to market by 30 to 50 percent and order cycle times by up to 73 percent. The oil and gas industry has used inbound materials hubs to pool inventory within a geography. With coordination between central planning and a material’s end users, inventory levels can be staged to make procurement more efficient. This also smooths the flow of materials to plants, preventing long lead times and supply interruptions. 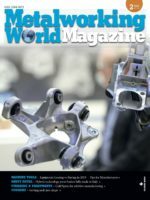 And the automotive industry has used hubs within 100 miles of a plant to enable bulk purchasing of components and to stage components for just-in-time delivery to the assembly line. 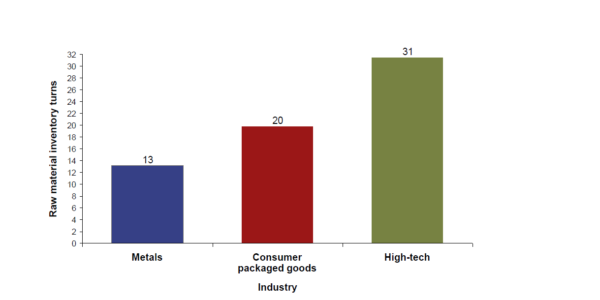 Industries with more complex supply chains, such as high-tech and CPG, have developed sophisticated planning processes to manage their inventory (see figure 3). A high number of turns indicates an ability to procure only the required materials at the right time to reduce excess inventory. These high-tech practices are on the leading edge despite the complexity of global supply chains, short lead times for orders, and short product lifecycles. Many plants neglect inventory management for raw materials, particularly for engineered metals. Forward-thinking companies that adopt an integrated approach to planning and embrace the use of digital tools can unlock a wealth of potential by reducing their inventory up to 50 percent. Previous Post Marcus Burton is the new Chairman Market Intelligence Committee of CECIMO Next Post High rates: target achived!